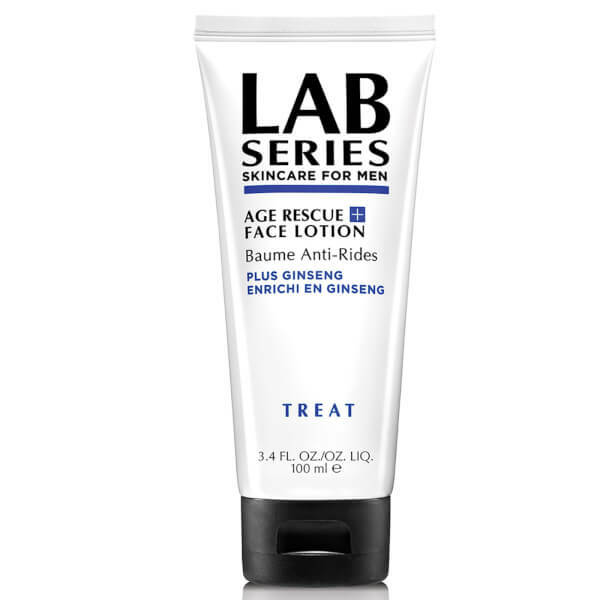 Revitalise tired skin with the Lab Series Skincare For Men Age Rescue + Face Lotion; a lightweight, fast-absorbing formula to target signs of ageing, stress and fatigue for a younger, well-rested appearance. Infused with a cocktail of beneficial ingredients, including AO-10™ (a complex of ten powerful antioxidants) and Ginseng, which is delivered by a patented G-Action™, the ultra-hydrating gel lotion smooths and replenishes skin, whilst defending against the damaging effects of environmental aggressors. 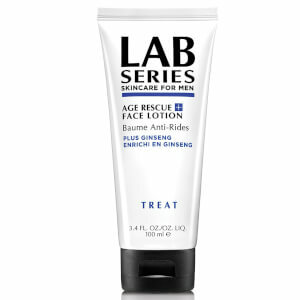 Helps to minimise the look of fine lines and wrinkles, and targets uneven skin tone and texture to reveal a soft, refined complexion with improved firmness and elasticity. No greasy or sticky residue. Apply to clean face and neck every morning and/or night. 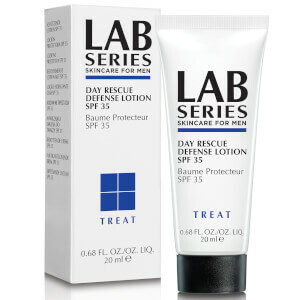 Can be worn alone or under moisturiser. Water\Aqua\Eau, Octyldodecanol, Glycerin, Polyethylene, Bis-Peg-18 Methyl Ether Dimethyl Silane, Camellia Sinensis (Green Tea) Leaf Extract, Butylene Glycol, Glyceryl Polymethacrylate, Lycium Chinense (Wolfberry) Fruit Extract, Polygonum Cuspidatum Root Extract, Vaccinium Macrocarpon (Cranberry) Fruit Extract, Vaccinium Angustifolium (Blueberry) Fruit Extract, Vitis Vinifera (Grape) Seed Extract, Panax Ginseng (Ginseng) Root Extract, Salvia Sclarea (Clary) Extract, Whey Protein\Lactis Protein\Proteine Du Petit-Lait, Astrocaryum Murumuru Seed Butter, Betula Alba (Birch) Extract, Hypnea Musciformis (Algae) Extract, Gellidiela Acerosa (Algae) Extract, Laminaria Digitata Extract, Sea Whip Extract, Punica Granatum (Pomegranate) Fruit Juice, Aloe Barbadensis Leaf Juice, Yeast Extract\Faex\Extrait De Levure, Panthenol, Caffeine, Acetyl Glucosamine, Phytosphingosine, Aminopropyl Ascorbyl Phosphate, Acetyl Hexapeptide-8, Palmitoyl Oligopeptide, Caprylyl Glycol, Acrylates/C10-30 Alkyl Acrylate Crosspolymer, Tocopheryl Acetate, Ammonium Acryloyldimethyltaurate/ Vp Copolymer, Peg-8, Trisodium Glycyrrhizate, Propylene Glycol Dicaprate, Lauryl Methacrylate/Glycol Dimethacrylate Crosspolymer, Sodium Hyaluronate, Ascorbyl Tocopheryl Maleate, Dimethicone, Nordihydroguaiaretic Acid, Tromethamine, Fragrance (Parfum), Maltodextrin, Disodium Edta, Phenoxyethanol, Mica, Titanium Dioxide (Ci 77891).